Can Trump build the 'world's greatest golf course'? NEW YORK (CNNMoney) -- The Donald likes to keep busy. One of the latest projects for Donald Trump, the billionaire real estate developer, reality show host and putative presidential candidate, is a new resort he's building in Scotland. He's, well, trumpeting it as the "world's greatest golf course." There's no denying that the setting is world class, a wild, windswept seacoast where frigid, stormy waters beat against the shifting sands of Aberdeenshire, on Scotland's eastern edge. 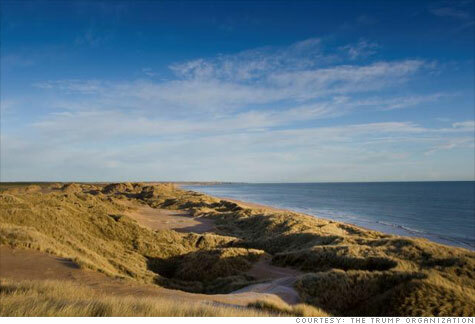 "It has the perfect location," said Trump, "fronting for three miles on the North Sea, acres of sand dunes of immense proportions, and with 1,400 acres of unspoiled land, it all adds up to being spectacular." Trump said he feels a special affinity for the Scottish countryside: His mother, Mary Macleod Trump, was born on the Isle of Lewis, off the west coast of Scotland. She was raised in a small village there before relocating to the United States in the 1930s after meeting Trump's father on a visit to New York. "This has been a labor of love for me," said Trump. Like much of what he has accomplished in his career, this project has not gone without controversy. Most locals support it because of the many jobs being created, both as a result of the £1 billion-plus being spent in construction and the permanent employment luxury golf resorts often provide. At least two local landowners, however, don't want to part with their properties to make way for the future, Trump style. One opponent, a salmon fisher and quarry worker named Michael Forbes, helped form an organization called "Tripping Up Trump." Forbes sold members of the organization a small part of his land to make it less likely, politically and legally, that he could be forced to sell. "Trump lost the battle for public opinion long ago," Forbes told The Guardian, the British daily, "and he's now lost any chance of bulldozing our homes." Trump shrugged off the controversy. The holdouts can be left in place, he said. And after four years of planning, ground was broken last summer and the course is expected to be completed some time in 2012. When completed, the facility will include two courses, a driving range, and a short-game practice area. There will also be a five-star hotel of 450 rooms, a mixed-use residential community of 950 condos, 500 single-family homes, 36 villas and staff accommodations. One big factor in the project's favor is that it preserves much of the landscape as open space, leaving vegetation and wildlife habitat in place, while reshaping and re-purposing the rest for the great game of golf. Most local residents were left undisturbed. "The community realizes that it will enhance the area and will also provide many jobs," said Trump. "There are no negatives. Sir Sean Connery came out in support of the development and we're moving ahead rapidly." The course will be of the "links" type, like St. Andrews, the 500 year-old course lying about 80 miles southwest and celebrated as the birthplace of the sport. Links is a Scottish word referring to open lands, usually of coastal sand dunes. Links courses, at least in Scotland, are especially challenging because of the harsh weather: The whipping winds can play havoc with approach shots. Links also have few trees or water hazards but often deep sand traps or bunkers. The Open Championship, sometimes called the British Open, is always played on a links course, and you can be sure the Donald is savoring the idea of his new course hosting a major tournament. "It will deserve to, and I'm certain that will happen," he said. The architect for the course is Dr. Martin Hawtree, whose works include Royal Birkdale and Sunningdale in England, Portmarnock in Ireland and Tarandowah Golfers Club in Canada. Trump said Hawtree's design, like that of St. Andrews, will incorporate many natural features. The main course will be a Par 72, 7,400 yards long with fairways meandering through the dunes, rolling down into little valleys and running alongside the shoreline. There will be fine views of the waves and sky, and the luxuriant shore grasses and shrubs, which change colors with the seasons. It's tempting to try to get Trump to compare his baby to the ancient course at St Andrews, but the Donald does not rise to the bait. "Trump International Golf Links Scotland will be a destination for golfers from all around the world," he said. "It will be incomparable."